Breaking News: Our David v. Goliath battle begins in Ohio! I am writing to inform you of an amazing opportunity available to you to possibly effect a major change in our system of reporting vote counts in the United States. For years, as we have reported to you. Edison Media Research has refused to release the raw data they gather during their exit polls. Raw data from exit polls is adjusted to fit the vote totals that come in from our vote tabulators across the country. The Media Consortium which hires Edison Media Research (EMR) uses the vote totals coming in from the tabulators as the real vote count. Normally, in other countries, exit poll data is supposed to show you what the real vote totals are. If the exit polls differ significantly from the computerized vote totals, the winning politician may be winning from electronic vote manipulation as opposed to the vote of the people. As you may know, there was a highly significant, unexplainable difference reported in the exit polls in the Democratic primary for twelve states this year between Hillary Clinton and Bernie Sanders. Although Bernie appeared to be winning more votes than Hillary, based on the voters leaving the polls, at the end of the day there was a huge discrepancy in 12 states between the exit poll data and the official vote awarded Clinton. When attorney Cliff Arnebeck, an associate of attorney Robert Fitrakis requested that EMR release its raw data on the Democratic primary,EMR not only refused to release the raw data but canceled all further exit polls for the remaining primary elections. An emergency exit poll that TrustVote.org sponsored in three counties in California, Alameda county, Santa Clara county and Contra Costa County revealed thatBernie Sanders won over Hillary Clinton in the Democratic primary by 7.9% rather than 3.1% as shown in the California Secretary of State’s website. It appears that the votes in these counties were electronically manipulated. Robert Fitrakis together with the support of many small donors associated with TrustVote.org was able to file a lawsuit against EMR. Please click on the PDF links below to read a copy of our original lawsuit. Baker & Hostetler LLP, the law firm connected with Edison Media Research reports a company income of $650 million dollars a year. They have responded to our lawsuit with a motion to dismiss it. The donation totals of TrustVote.org are only a tiny fraction of this amount. Battling Baker and Hostetler and Edison Media Research will be truly a David v.Goliath battle! If we win in this lawsuit, Bob Fitrakis has been willing to fight Baker and Hostetler’s motion to dismiss the TrustVote.org lawsuit for very little. Nonetheless, Bob estimates that still we will need at least $20,000 more to pursue this lawsuit against Edison Media Research all the way to the end. If we prevail in this lawsuit, we will be able to see the raw data collected by EMR during the last primary. Bernie Sanders will be able to see the more accurate percentages of votes that he really received before the exit polls were edited. And both the USA and the rest of the world, will become aware of the editing of American exit polls that happens routinely in the higher office elections in the US on a regular basis. $4500 was already raised by TrustVote.org donors to start this lawsuit and maintain it up to this point. THANK YOU, THANK YOU for all of your donations thus far!! Can we count on you to contribute more to help us win this lawsuit? Many TrustVote.org donors have donated small amounts towards these very important issues. Whatever you can give, large or small will be DEEPLY appreciated! With many people donating $10 and $20 dollars, the total contribution amount begins to mount up. And, just yesterday, a TrustVote.org donor has agreed to match any of your donations dollar for dollar! So the battle has really begun! Come help us transform elections in our country, have a voting system we can count on and create a true democracy here in our country! Here is what Robert Fitrakis writes about the lawsuit against Edison Media Research. In the case of Johnson v. Edison Media Research (EMR), plaintiff, Pete Johnson and his counsel, Robert Fitrakis filed a motion on September 20, 2016 to keep the case from being dismissed. The legal filing notes that, “Edison Research is the exclusive provider of election exit polls to the National Election Pool consisting of ABC, CBS, CNN, FOX, NBC, MSNBC and the Associated Press….” Johnson points out, “The results of the ‘exit polls’ that EMR conducted on March 15, 2016 during the Presidential Primary Elections in the State of Ohio did not match the actual election outcomes when the votes were counted. Lori’s note: A secure web application means an information feed that is not available to the public. In other words a secret information feed. Many of the same concerns about exit polling were raised by U.S. Representative John Conyers, Jr. in a January 20, 2005 open letter to Edison Media Research. Conyers pointed out that the adjusted exit poll numbers provided by Edison in the 2004 presidential election were “virtually impossible as a statistical matter.” Conyers issued Edison a “…request to receive the actual raw exit poll data that you obtained.” Edison refused to cooperate with the Ranking member of the House Judiciary Committee. Johnson v. Edison is another attempt to end the non-transparency in the U.S. voting process, one that allows private for-profit companies to secretly program the voting machines and tabulators with proprietary software, but also allows Edison to secretly adjust exit polls numbers to support the statistically impossible. Below are the three PDFs of the lawsuit. The first one is the original lawsuit against Edison Media Research by Bob Fitrakis, the second PDF is Edison Media Research’s response to our lawsuit. The third one below is our response to Baker and Hostetler’s motion to dismiss our lawsuit. Was your vote counted? Are you frustrated with the results of the California primary? Was your group’s efforts to observe the ballot count process suppressed by your county’s election office (aka Registrar of Voters)? Maybe your experience was great. Either way, we want you to join us for our upcoming Take Back the Vote: An Emergency Conference to Prepare for Upcoming Election(s), happening October 8th and 9th, in Richmond, California. Among many other election related topics, we will be training poll workers and precinct monitors on irregularities to watch out for, on Election Day. Our mission is to ensure every ballot is counted as cast. Let’s do the work to create a real Democracy! The focus of the conference has recently been expanded to include issues around election integrity across the country which will possibly impact the outcome of both the 2016 Presidential election and senatorial and congressional election results for both parties across the United States. If you can’t attend, please donate to sponsor the event and/or an individual’s participation. Only $25 for the weekend. Editorial note by Lori Grace: The final solution that we all would want is paper ballots that are counted ideally by people in elections that can be fully observed and audited.We know that this will not be our option for this year. We can only put out this intention. Hopefully, the United States will one day become more like Germany, Ireland, Iceland and Switzerland. Please stay tuned to trustvote.org and our up-coming articles and events, where we will be looking at what we can do to create more reliability in our November elections! To Support the California and Ohio Lawsuits Please Donate Today! https://fitrakis.org/wp-content/uploads/2016/10/LorinBob.png 208 385 Fitrakis https://fitrakis.org/wp-content/uploads/2017/01/fitrakisprocedit_340-3-300x78.png Fitrakis2016-10-04 11:15:292016-10-04 13:33:20Breaking News: Our David v. Goliath battle begins in Ohio! Sunday, October 2, 2016, the Columbus Dispatch reported that Ohio Secretary of State Jon Husted refused to mail absentee ballot applications to over one million Ohio voters. Husted refused to mail to 1,035,795 registered voters. Those left off Husted’s mailing list include 650,730 registered voters who had changed their address. Of these, 568,456 moved within the Buckeye State and are still eligible to vote. The other 82,274 moved out of state and are presumably ineligible to vote. The key target of Husted’s deregulation scheme are the remaining 385,065 voters who are registered at their current residence but simply failed to vote in the 2012 or 2014 federal elections. Husted has had these voters harassed by their local Boards of Elections sending them letters demanding they verify their address. Failure to do so could lead to the voters’ deregistration and has led to them not being offered an absentee ballot. Social science data shows that the crux of Democratic Party voters move more often and vote less often than Republicans. Husted’s strategy is to purge poor and minority voters from Ohio rolls. A U.S. federal court had recently blocked Husted’s strategy of just outright mass purging minority, young and mostly Democratic voters. 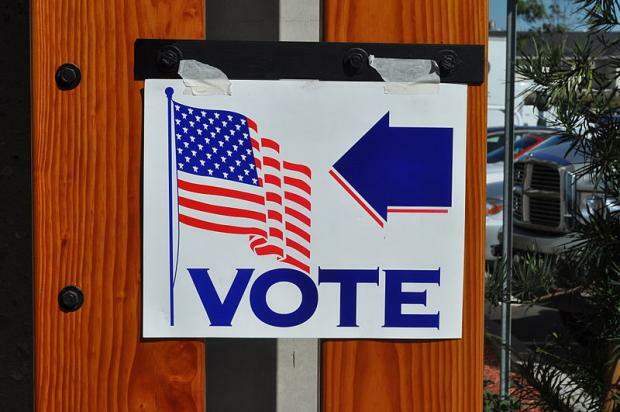 A recent 2-1 ruling by the 6th Circuit Court of Appeals halted various Husted practices including the removal of any voter who hadn’t voted in six years in Ohio, even if they remained at the same address. However, the ruling did not block Husted from doing an end-run by using the absentee ballot application mailing to eventually deregister voters. Husted has never been able to explain why, in a state that requires ID at the polls to verify a voter’s address, any voter would be removed from the computerized voting rolls. There’s no logical reason other than partisan politics to purge a registered voter in a computer era. 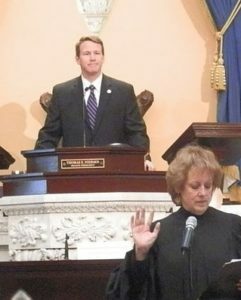 Overall, Republican Husted has targeted 13 percent of Ohio’s registered voters for absentee ballot disenfranchisement. Also, voters who received Husted’s absentee ballot application mailing may have noticed the specific instructions on the envelope to the post office not to forward the mail to a new address, although the post office can return it to the sender. Husted’s office has used the return of two pieces of mail intended for the same voter to the secretary of state’s office or county board of elections as a reason to purge that voter. Husted also admitted to the Dispatch that some of his absentee ballot applications got lost in the mail. Husted, who claims to be a fiscal conservative and has in the past refused to have backup paper ballots at polling sites because of the cost, cannot seem to explain why he is mailing more than 6.5 million absentee voting applications anyway. Husted has allowed his office and the county boards of elections, without explanation, to disable their electronic audit logs that are built into central tabulators as well as certain county ballot scanning machines. The corporate media and the Democrats are obsessed with the “Russians.” Donald Trump rants about a mythological army of voters voting multiple times. But the real threat to our election system comes from private for-profit corporations that register voters, control voter databases, then count and report the vote with secret proprietary software and zero transparency, accountability, or recourse. After ignoring or attacking the reportage since Florida 2000 of Bev Harris, Greg Palast, freepress.org and numerous others, the corporate media seems finally to be getting the message: under the current system, any American election – even the one for president – can be stripped and flipped by a tiny handful of electronic hackers working anywhere from the Kremlin to a party HQ to a state governor’s office to a teenager’s garage. Former national coordinator for counter-terrorism Richard Clarke, reporting for ABC News on August 19, 2016, analyzed the particular security problems related to battleground states like Ohio and Florida: “In 2000 and 2004, there were only a handful of battleground states that determined which presidential candidate had enough Electoral College votes to win. A slight alteration of the vote in some swing precincts in swing states might not raise suspicion. Smart malware can be programmed to switch only a small percentage of votes from what the voters intended. That may be all that is needed, and that malware can also be programmed to erase itself after it does its job, so there might be no trace it ever happened.” Clarke was on the White House National Security Council during both Bill Clinton’s and George W. Bush’s administrations. On August 30, 2016, the Washington Post wrote: “Deleting or altering data on voter rolls could cause mayhem on Election Day disenfranchising some voters. Many voting machines themselves also are vulnerable, especially touch-screen systems that do not create a paper record as a guard against fraud or manipulation.” The Post also supplied a list of the 15 states with the most vulnerable voting systems. 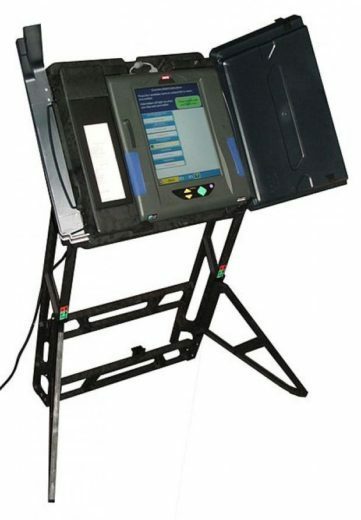 6) The security (or lack thereof) of various voting machines types. Election Justice’s well-documented estimate that Sanders lost 184 delegates means that if the election had been conducted fairly, the Senator from Vermont would now be the Democratic nominee. Another document essential to understanding election irregularities that allowed Hillary Clinton to capture the Democratic Party nomination is a paper co-authored by Axel Geijsel of Tilburg University in the Netherlands and Rodolfo Cortes Barragan of Stanford University. Their analysis found that primary election results in states with the most vulnerable and hackable voting machines and without a paper trail overwhelmingly favored Hillary Clinton 65 percent to 35 percent. Sanders led Clinton 51 percent to 49 percent in states where the vote count could be verified with a paper trail. The correlation between the increased Clinton vote and the increased vulnerability of the voting machines has been avoided like the plague by the corporate media. Equally important to read is mathematician Richard Charnin’s blog. Charnin is a man the mainstream media often attacks – but not with mathematical formulas to rebut Charnin’s detailed analysis. Rather they attack him because, like the vast majority of Americans, he believes that John F. Kennedy was not killed by a lone gunman. In 2016, official Democratic primary vote counts compared to exit poll results were significantly outside the margin of error in 12 of 26 states. Charnin concluded that the probability of those official vote tallies being correct are one in 78 billion. There were no such discrepancies in this year’s Republican primaries. Now 16 years after the theft of the presidency in Florida 2000, and a dozen since it was done again in Ohio 2004, the corporate media are approaching consensus that it is indeed very easy to strip millions of legitimate citizens from the voting rolls, and then to hack electronic voting machines and computerized central tabulators to flip the official final outcome. The threat to this year’s election does not come from non-existent armies of mythological hordes voting multiple times. It comes from the private partisan companies with their secret proprietary software that control the voter rolls, the electronic machines, and ultimately the final outcome at all levels of government. The mega-corporations are the ones that flipped George W. Bush into the White House and Hillary Clinton into the Democratic nomination, not to mention manipulating countless Senate, House, and state and local elections along the way. For a hopelessly vulnerable electronic election system which is flawed, hackable and riggable from top to bottom, there is just one solution: transparent unhackable voter rolls, and universal hand-counted paper ballots open to public scrutiny from the precinct level to the final official tallies, as dutifully reported by our slowly awakening corporate media. 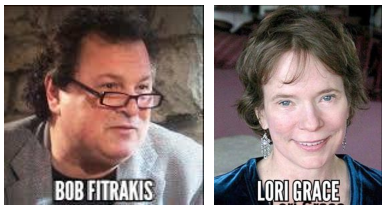 Bob Fitrakis & Harvey Wasserman are co-authors of The Strip & Flip Selection of 2016: Five Jim Crows & Electronic Election Theft, available at www.freepress.org and www.solartopia.org, where Bob’s Fitrakis Files and Harvey’s Solartopia! can also be found. 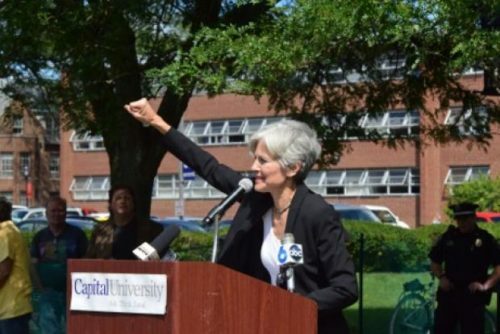 So the corporate media indulged itself with the idea that Green Party candidate Jill Stein flew to the “wrong city” for a Friday rally at Capital University in central Ohio. Her lateness was in the headline, lead and conclusion of every mainstream article about the September 2 event. As usual, they ignored the real story. Jill originally had a speech scheduled in Cincinnati, which was moved, although the tickets weren’t. So she was in Covington, Kentucky about a half-hour before the scheduled noon start of her talk at Capital, where Harvey is in his thirteenth year of teaching (primarily UC200: Cultural and Ethnic Diversity). No big deal. Jill hopped into a Lyft and headed north. Estimated time of arrival: about 2:30. Meanwhile, Harvey told Jill’s crowd of about 100 (many of them his students) that she was on her way and took orders for pizza. Since the local media craves the details, here they are: seven cheese pies, seven with onions, peppers and mushrooms, and one vegan (for Harvey, Suzanne and two other takers) with tofu and no cheese. (Total price: $220, Harvey’s most memorable campaign donation). We then opened the mic. Among others, long-time Green Party activist Anita Rios spoke. So did Bob, Ohio Green Party Co-Chair, candidate for Franklin County prosecutor, a professor at Columbus State Community College, and Editor of the Columbus Free Press/www.freepress.org. Bob and Harvey have co-authored seven books on election protection, dating back to the 2004 theft of the presidency by George W. Bush and Karl Rove. At one o’clock we switched over to Harvey’s iPhone. One of Harvey’s students hooked us up to the PA and we played the Jill Stein campaign theme song, followed by a good long session from the Grateful Dead. It was a gorgeous Friday afternoon on the large lawn at a lovely liberal arts college. People sat, talked and stretched out. Thanks to the modern miracles of the telephone, texting, email and social media, the crowd grew by half. A klatch of about a dozen libertarians hovered in the background wearing Gary Johnson t-shirts. We asked them if it was true that Johnson, who advocates legalization of pot, had promised not to smoke it while in the White House. We told them that was a mistake. When Jill arrived she was greeted by Capital’s much-loved President Beth Paul. Back in 2008, the school hosted an appearance from candidates John McCain and Sarah Palin. George H.W. Bush and other presidents, ex-presidents and candidates—-including Barack Obama—-have appeared here. When Bob finally introduced her, we had a rested, happy crowd of enthusiastic students, locals and Green Party volunteers. Jill spoke of the Green New Deal and her plan to put hundreds of thousands of Americans to work to create a clean energy economy by 2030. She asked the student crowd how many had taken out student loans and more than half raised their hands. The crowd roared approval when she announced she would cancel all student loan debt, which affects 43 million Americans. What should have been the lead was Stein’s call to cut the U.S. military spending in half. She pointed out that our nation has 900 military bases all over the world. Other than the U.S., all the other nations on the planet combined have only 30 military bases outside their borders. We took questions after Jill’s speech, then a group photo, and a long selfie line. A good time was had by all. By the time Jill hopped in Anita’s car to head to Cleveland for her next gig, this time just a half-hour late, the media had filed its story, but obviously missed an excellent rally. The media are also misrepresenting Stein’s official ballot status: A Dispatch article Monday, September 5, said: “Green Party nominee Jill Stein is on track to make it in at least half [of the state ballots].” At the time the Dispatch published this AP report, Stein was already on the ballot in 41 states and likely to end up on at least 45 states, or 95 percent of the states. Only in South Dakota is she not on the ballot by name or as a write-in, and in only three states is she certified as a write-in only – Indiana, North Carolina and Georgia. A “…masterful dissection of elections and voting as a system between the Civil War and today. Quite a time period to cover in less than 100 pages, but authors Bob Fitrakis and Harvey Wasserman face this challenge, prefaced and introduced by the famed author and investigative reporter Greg Palest and actress and activist (head of Progressive Democrats of America) Mimi Kennedy.” ~ Marta Steele. More than a few have wondered why the Green Party headed for Houston in August to nominate Jill Stein for President. I heard a few press observers note that maybe it was because Houston is one of the hottest and most polluted cities in the nation – perhaps more in need of Stein’s proposed Green New Deal than any other major U.S. city. The reality is that the national Greens chose Houston because the state Party there practices thoroughgoing grassroots democracy. Simply put, Houston’s state Green Party had the best proposal. The Ohio Greens had proposed Toledo and were a finalist, with a vision of the Cleveland fascistic Republican convention contrasted with adecentralized democratic meeting in the city that is, for all practical purposes, a suburb of Detroit. Prior to the Saturday, August 6 nominating convention, there were no major questions outstanding. Stein was the presumptive nominee, had chosen her Vice President, and her platform was clear. This is despite the fact in the past few months, Stein had offered Bernie Sanders to be the Green Party presidential nominee (with Stein as VP), and offered former Ohio State Senator, Sanders supporter, and renegade Democrat Nina Turner a spot as her running mate. There was also talk of Cornel West as a VP candidate. But in the end, Stein turned to a stalwart human rights activist with ties to the Black Lives Matter movement to balance the ticket and reach out to the Party’s growing minority base, Ajamu Baraka. There was some tension in Stein’s nominating process when presidential hopeful Sedinam Kinamo Christin Moyowasifza-Curry immediately objected to the Alabama delegation casting their votes, because she claimed she had not been invited to that state. Moyowasifza-Curry has argued vigorously for the Green Party becoming a minority-led vehicle to advance issues of concern to people of color. Although there were frequent procedural objections from the floor by Moyowasifza-Curry, Stein easily won the nomination. The platform that, among other things, calls for reparations for African Americans, passed with little debate and only one dissenting vote. The platform also included the Green Party’s commitment to election integrity, calling for the end to all privately-owned proprietary computer codes in the U.S. electronic voting process. A highlight of the convention was a livestream by Julian Assange from the Ecuadorian Embassy in Britain. He spoke to the crowd about movements like the Green Party and how they keep American politics “honest.” He repeated his assertion that asking people to vote between Trump and Clinton is like asking people to choose between “cholera and gonorrhea.” Both Assange and West argued that the legendary “triangulation” of the Clintons, while they govern from the corporate center, is fanning the flames of right-wing takeovers to hold the Left at bay. Stein asserted that all the fears of a Trump presidency – naked oligarchies, endless wars – actually occurred during Hillary Clinton’s tenure as secretary of state. Stein also pointed out, along with West, that the current U.S. mass incarceration state that has disproportionately arrested blacks and Latinos was fueled on the federal level by the policies of Bill Clinton. The key unanswered question from the convention is how many of the Berners will bolt from the preference of their leader and dedicate their energy and enthusiasm to the Stein campaign. Reports are already coming in of record small donations to the Stein campaign. In a press conference following her nomination, Stein said she had raised more money in the last three weeks than in the first year and half of her campaign. Will the long sought-after, post-60s dream of an eco-socialist alliance, with state and local elected officials finally breakthrough in 2016? 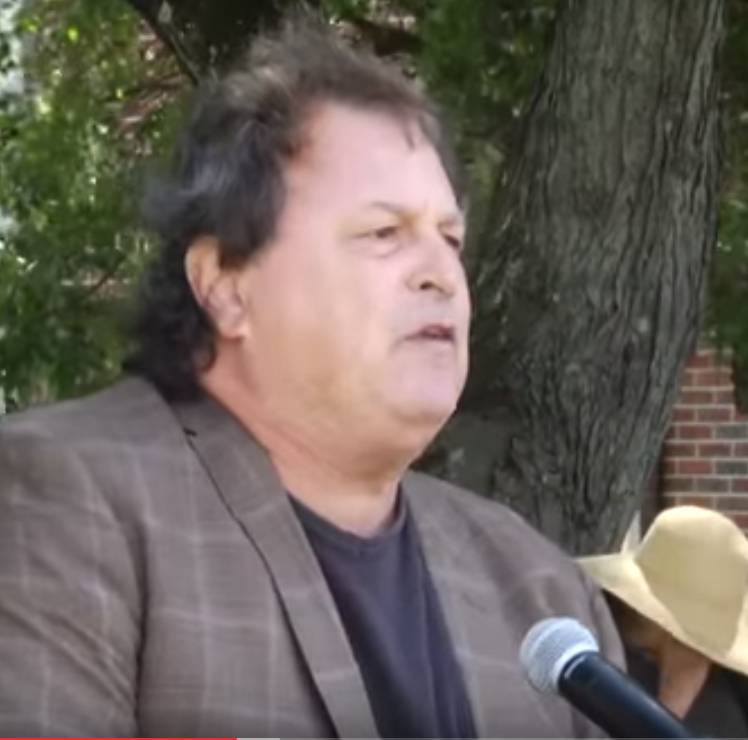 Bob Fitrakis, Co-Chair of the Ohio Green Party, was an alternative delegate to the 2016 national Green Party convention and is the Federal Election Commissioner of the Green Shadow Cabinet. 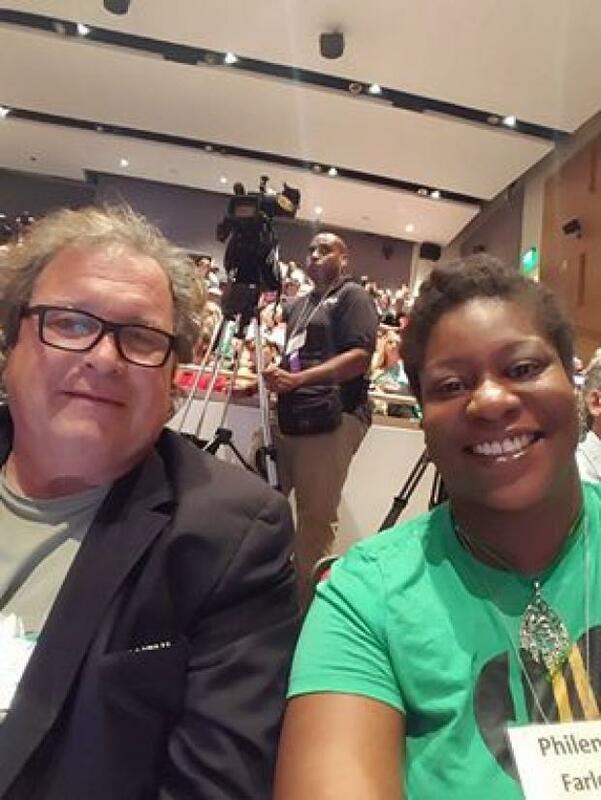 Why would the Ohio Green Party Co-Chair end up addressing Bernie Sanders delegates in Philly during the Democratic Party convention? I found myself with them in a pizza place in King of Prussia, Pennsylvania at the behest of the mostly-California-based Election Justice organization. In a crowded back room, angry and angst-ridden Berners, as they call themselves, listened intently as election protection attorney Bill Simpich outlined what can only be described as a Clinton election coup in the California primary. Simpich has filed three lawsuits in California so far, trying to ensure every vote is counted. Immediately following the primary in California, 2.4 million votes – overwhelmingly from Sanders’ supporters – remained uncounted, resulting from a combination of dirty tricks and illegal voter suppression activities. When all the votes are counted, Sanders would likely be the victor. 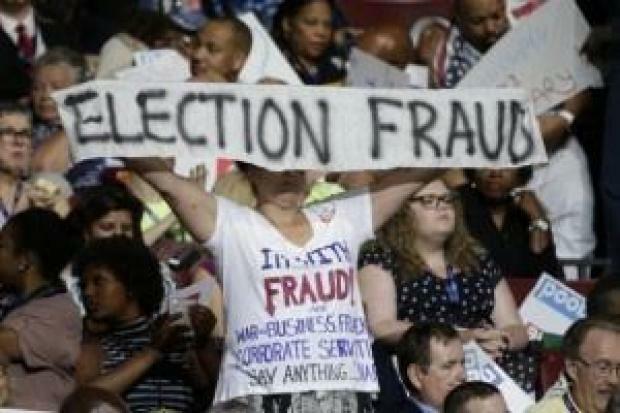 Berners were outraged over the apparent election fraud and the Wikileaks release of 20,000 Democratic National Committee (DNC) emails just prior to the start of Hillary Clinton’s well-orchestrated coronation. They pondered the suspicious death of DNC staffer Seth Rich, found shot twice in the back on July 10 before he was set to testify in the Clinton email investigation. The delegates were particularly pissed about the content of one Wikileaked email from a DNC staffer named “Marshall” to DNC Communication Director Louis Miranda. Marshall wondered about Bernie – “Does he believe in a God.” In another email, staffers plotted to describe Bernie as a “Jew” and “atheist” in hopes of discouraging support for him from West Virginia voters. DNC Chair Debbie Wasserman-Schultz, implicated in the email scandal, was initially “quarantined to keep the peace,” according to DNC officials. But, Wasserman-Schultz resigned in shame only to be immediately hired by the Clinton campaign. I explained to the crowd that the lawsuit I filed, Johnson v. Edison Research Group, accuses the presidential primary exit pollsters of collaborating with secretaries of state to deliver bad numbers to the giant media polling consortium – NBC, CBS, ABC, Fox, CNN and the Associated Press. While none of the Republican primary election exit poll results were statistically suspicious, 12 out of 26 Democratic primary exit poll results were so far off the actual vote totals that they would not have been validated by the U.S. State Department Hillary used to head. Among the worst were Arizona, Alabama, Ohio and New York. Edison had unexpectedly canceled all further primary election exit polling just prior to the California vote. Suddenly the Bernie supporters were asking “What should we do?” about all the election fraud. Their solution was to issue a statement about the primary election fraud and Wikileaked emails, and stage a walkout at the convention after Clinton’s name was put in nomination for president. They emailed a draft statement to participants around 1:30am. It was now clear that the walkout would happen and chaos would ensue. Outside the Wells Fargo Center convention site, people were in the streets daily marching and chanting and setting up an “Occupy the DNC” continuous convergence at FDR Park. I joined Cheri Honkala’s, and the Poor People’s Economic Human Rights Campaign’s “March for our Lives” Monday at 3pm starting outside the Philadelphia City Hall. Honkala, Jill Stein’s Green Party Vice Presidential running mate in 2012, was joined by Cornel West, a leading Sanders surrogate and platform spokesperson who had recently endorsed Stein for president this year. West was his usual nattily attired self, in a three-piece suit, in preparation for the 4-mile march in 100-degree temperatures. Jill Stein spoke briefly at the start of the march. Chants included: “Hell no DNC! We won’t vote for Hillary!” and “Jill, not Hill!” Halfway through the march it paused, and I was handed a megaphone to address the marchers on the issue of election fraud. I denounced the fact that “Private, for-profit, partisan corporations secretly count our votes and maintain our pollbooks with secret proprietary software.” I urged occupation and arrests to end this unacceptable and undemocratic practice. Two voting machine companies Dominion (formerly Diebold) and Hart Intercivic were listed as donors to the Clinton Foundation. As the axiom goes, there’s not much money in vote counting, but a lot in vote results. Fifty-four marchers took arrest for going over the fences outside the Wells Fargo Center protesting election fraud and Citizen’s United. They were cuffed and given bottles of water, much to their relief. Under a large white tent in FDR Park, Green Party stalwarts like Medea Benjamin, David Cobb and hip hop artist Immortal Technique revved up the crowd in anticipation of Jill Stein’s appearance. I saw a “Rigging is not Winning” sign. As an election attorney for the Green Party of Ohio, I was drawn into the conversation and we realized the legal implications – stall as long as we can so Jill can finish speaking. We refused to vacate the tent and shut down the rally as Jill was being ushered on the stage. We demanded a note from his supervisor. While Jill spoke, inviting the Berners to break from the Democratic Party, the Parks and Rec guy returned to show us an email on his phone verifying his orders. We perused it slowly and sent him away a second time where he vowed to return with police. He did, but by that time Jill was done speaking and Immortal Technique was rapping the rally up. Then came the righteous cleansing rain. We were receiving constant messages from delegates in convention center. The first important post I noted on Monday was from a California delegate at 5:48pm urging people to join a class action lawsuit against the DNC. There were six links to devastating online articles and videos regarding the DNC’s election manipulation. Many of the delegates messaged that they were being threatened with having their delegate credentials pulled, something that actually happened to Ohio State Senator Nina Turner. Reports are that she had refused to specifically endorse Clinton in her planned “second” to the Sanders nomination. Numerous Bernie supporters reported that their Bernie signs were confiscated by convention officials and Hillary delegates. New Yorkers complained that a white noise machine was placed by them to drown out their Hillary heckling. Later in the week during the convention when Tim Kaine took the stage election integrity activists dropped a green banner over the side of the balcony reading “Election Fraud #wikileaks” and Hillary’s acceptance speech was marred by glowing neon green vests and T-shirts that read “Enough is Enough” indicating their plan to vote Green Party in November. Jill Stein was invited in to the convention center to be interviewed by Fox News, causing consternation. As a fellow for the Institute for American Democracy and Election Integrity, I spoke on a panel at the parallel People Demanding Action (aka Progressive Democrats of America) conference on election integrity. Many in the audience were California Bernie delegates and during the Q and A they came to the conclusion that they should walk out during Clinton’s nomination address. There were two dissenters that led to a profane shouting match during the discussion. After the Q and A, I raced back to FDR Park to join comedian/news analyst Lee Camp and my favorite investigative reporter Greg Palast on a panel. It never happened because the occupiers were heading over to the convention center for another round of arrests. Now that it’s over, I read a report that the FBI was on the DNC email case. The great irony is that the FBI has announced it is going to investigate the source of the leaks, but not any potentially illegal activity that was in the email leak. On a more positive note, I read a July 29 open letter to Bernie Sanders by 22 former campaign staffers and his current National Latino Outreach Deputy Director Cesar Vargas urging him to run for president on a Sanders/Stein Green Party ticket. He promises to prosecute polluters, rogue cops, and corporate criminals. What I hope to accomplish as Franklin County Prosecutor? 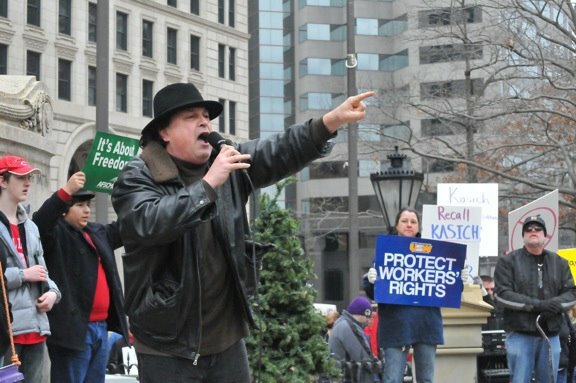 Bob Fitrakis is currently the co-chair of the Ohio Green Party and the Franklin County Green Party. He ran as the Green Party Lt. Governor with Anita Rios in 2014 when the Green Party received over 100,000 votes in Ohio. He was also a candidate in the 3rd congressional district in 2012 and as the Green Party endorsed candidate for governor of Ohio in 2006. He has been a member of the Green Shadow Cabinet as the Federal Elections Commissioner since 2013 after he worked with Jill Stein, the 2012 presidential candidate. Fitrakis is a Political Science Professor in the Social Sciences department at Columbus State Community College, where he won the Distinguished Professor Award in 2012. He has a Ph.D. in Political Science from Wayne State University and a J.D. from The Ohio State University Moritz College of Law. He was a Ford Foundation Fellow to the Michigan State legislature and currently serves as a Near East Area Commissioner. He co-authored “What Happened in Ohio: A documentary record of theft and fraud in the 2004 election” (New Press, 2006), and has authored or co-authored 12 other books including six on election integrity. Fitrakis is the editor of the Free Press, freepress.org and columbusfreepress.com. Fitrakis was admitted to the Ohio Bar in 2003. In his first major case, he sued Ohio State University for violating students’ civil rights who were organizing the annual Hemp Festival, and won. He represented anti-fracking activist madeline ffitch, arrested for civil disobedience at a fracking well in southeastern Ohio. He also had charges dismissed against Kevin Egler in Kent, Ohio for posting an “Impeach Bush” sign on public property. He was served as the attorney for the Columbus NAACP, Rev. Jesse Jackson, Congresswoman Cynthia McKinney, the Ohio Green Party, the Ohio Rights Group, Columbus Film Festival, The Neighborhood Network, Columbus Institute for Contemporary Journalism, among others. Fitrakis has been an election protection activist since March 1994, when he served as an international observer for the national elections in El Salvador. He co-wrote and edited the El Salvador election report for the United Nations. Fitrakis was an election protection attorney on November 2, 2004 in Franklin County. After witnessing election suppression, he called the first public hearings on voter suppression and election irregularities and was one of four attorneys to file a challenge to Ohio’s presidential elections results: Moss v. Bush and Moss v. Moyer. In 2006, Fitrakis was co-counsel in the King-Lincoln-Bronzeville lawsuit against the Ohio Secretary of State’s office seeking to end racially discriminatory electoral practices in Ohio and to ensure free and fair elections. He authored a 50-point consent decree to ensure election integrity in Ohio submitted to the current Secretary of State. Many of these proposals have been adopted by the state of Ohio. 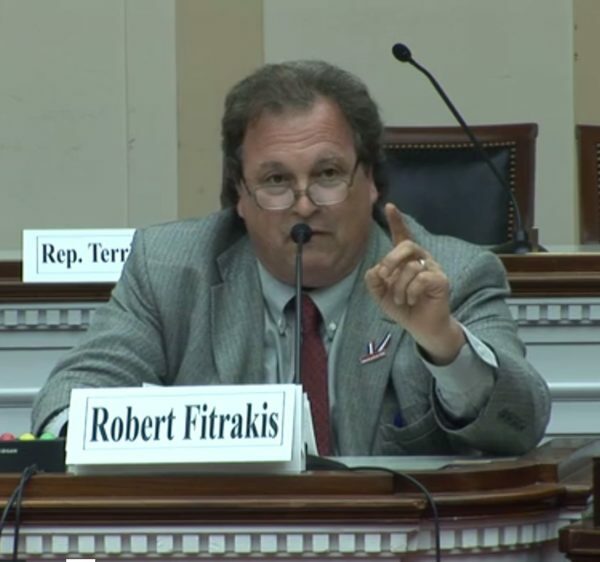 In December 2004, Fitrakis testified before the Judiciary Committee of Congress at the request of Rep. John Conyers in both Washington D.C. and Columbus. The information gathered from the Fitrakis’ investigations and hearings resulted in the Conyers Report, “What Went Wrong in Ohio?” released January 5, 2005. Fitrakis spoke to the National Press Club in Washington D.C. on Ohio’s election issues. Fitrakis briefed John Kerry, worked on election reform with Rep. Maxine Waters (D-LA), and briefed the Democratic Party Senate leadership. He later briefed the Congressional Progressive Caucus as well as the Congressional Black Caucus and the Senate Democratic leadership. Dr. Fitrakis testified at the Election Assessment hearings in Houston, Texas in 2005, which became part of the Carter-Baker Commission Report on federal election reform. https://fitrakis.org/wp-content/uploads/2016/04/April212016CongHear-e1472164021230.jpg 562 600 Fitrakis https://fitrakis.org/wp-content/uploads/2017/01/fitrakisprocedit_340-3-300x78.png Fitrakis2016-08-25 17:23:302016-08-25 17:26:41Green Party candidate Bob Fitrakis is running for Franklin County Prosecutor in 2016.